NOTE: These are the instruction sheets that come with the trick. This PDF does not explain how to make up a deck. 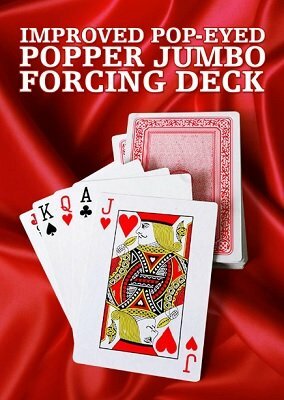 The Jumbo Pop Eyed Popper Deck is one of the most used "trick decks" of professional magicians and mentalists from all over the world. This "secret weapon" is one of the cleanest ways to force a card without sleight of hand. This deck is drastically improved over older versions. No more fumbling to separate paired cards. This has been a problem for many magicians. These cards have been especially prepared so you only have to place your thumb on any of the four corners and the cards instantly separate with no hesitation or fumbling, ensuring the spectator gets a force card. One possible effect: An envelope is placed on a table with a prediction inside. The envelope is not gaffed, switched, etc. during the process of the card trick. As a matter of fact, the prediction can be mailed months in advance to a spectator for a special occasion. A jumbo deck of cards is fanned out showing each card to be totally different, shuffled and cut. The spectator chooses any card and turns it over. They then open the prediction and it is the EXACT card that was chosen. Cards are red back and plastic coated for ease of fanning. Includes Devin Knight’s improved handling that will fool many magicians familiar with the old version. 1st edition 2017, 2 pages.